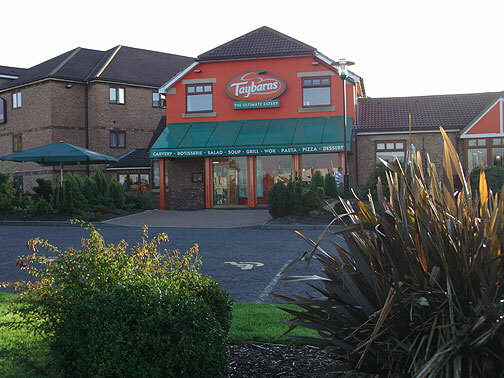 Taybarns all you can eat restaurant is situated in Simonside, South Shields, just off the roundabout on Newcastle road with Vic Young's garage as a landmark if your lost. If your looking for a much as you can eat for a fixed price then you have come to the right place with lots of different styles of food to choose from you can eat till your hearts content or your stomach is full lol, how it works is on arrival to the restaurant you pay for your meal in advance the price of which changes through the day (discounts for children) then you take your seat (if you like soft drinks then you pay a little bit extra for the glass which you can then top up as many times as you like) pick up your plate and cutlery from the table then get started by going to any counter and helping yourself to any food you choose, once you have finished you can go back as many times as you like and pick up a fresh plate each time, remember to keep a bit spare room to have a go at their wide range of sweets and cakes or even pull your own ice cream from their ice cream machine this a great favourite with the children and big kids at heart. The restaurant does have its own bar to one side but if your looking for a drink in a more traditional pub then the Simonside Arms is only just over the road.